ARLINGTON, Va.–Last week, teams of students from 13 schools–representing six countries–tested their engineering skills by developing autonomous boats during the 11th annual International RoboBoat Competition, held June 18-24 in Daytona Beach, Florida. 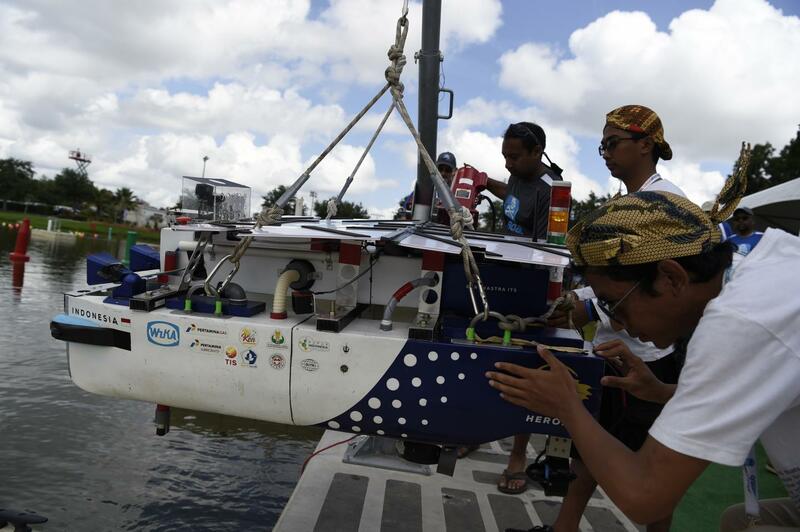 "The challenges might seem simplistic, but before the boats even make it to the water to try and complete the course, there's a lot complex engineering that goes into the ASVs' development," said Kelly Cooper, a program officer in ONR's Ship Systems and Engineering Research Division–and a RoboBoat judge. "This competition really showcases the technical ingenuity of the students." That ingenuity will be needed as the desire for autonomous systems continues to grow–not only for the naval service, but across the commercial sector as companies like Dominos, Amazon and Uber all want to use autonomous vehicles for deliveries. And while these companies are making strides toward autonomous services for the average consumer, the Department of the Navy (DoN) is looking to use the technology to "create fundamental shifts" in the way the Navy and Marine Corps conduct future naval operations. According to the recently released DoN Strategic Roadmap for Unmanned Systems (short version), the goal is to "transform modern warfare" by seamlessly integrating unmanned systems into the naval services and across all domains. This is something that ONR is already doing–pushing the path forward for autonomous technologies like swarming boats, aerial vehicles and unmanned surface ships and helicopters. "RoboBoat showcases the talents of future engineers and serves as a basic introduction to some of what the Navy needs its autonomous systems to do," said Cooper. "We know there will be a strong pull from the commercial sector to have these kids come work for them, but we want the participants to know that the future is bright with the naval services as well–we have the jobs and we need their talent, too." As in the past, this year's teams, largely composed of university students, were evaluated on their vessel design and performance. The design component focused on innovation, quality of engineering and craftsmanship. The performance component tested a vehicle's ability to execute specific missions on the water without any human interaction. The mission tasks demonstrated the maritime systems' autonomous behavior in different scenarios, including: speed; automated docking, which demonstrated the ability to launch and communicate with an aerial drone; finding a path in a crowded area; target identification; precise navigation; and, finally, return to dock. Institut Teknologi Sepuluh Nopember (Indonesia) was this year's biggest winner, bringing home the top prize of $6,000. Georgia Institute of Technology won second prize and $5,000; Hagerty High School (Florida) took third and $3,000; and Embry-Riddle Aeronautical University (Florida) came in fourth, earning $2,000. The other participating institutions were Florida Atlantic University, Universitas Diponegoro (Indonesia), University of Iowa, University of Michigan and University of Ottawa.